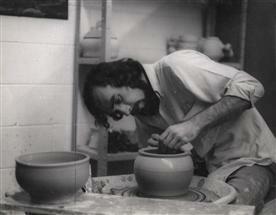 and in 1967 enteredSheridan College of School of Design where he studied the Art of Pottery. 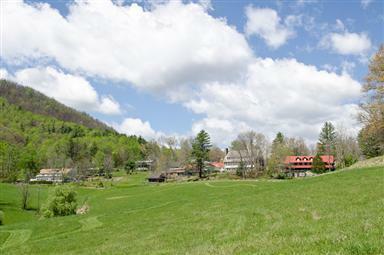 Penland School of Craftsin North Carolina. at the prestigious Penland School of Crafts. 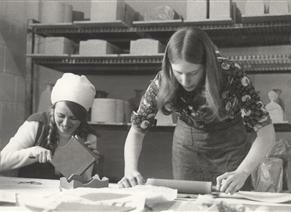 the Pottery Studio in 1971.
and at Sheridan College School of Design. 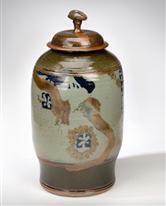 crafting a distinctive line of functional stoneware pottery. His work is included in many public and private collections. the Glenbow Gallery Permanent Collection. 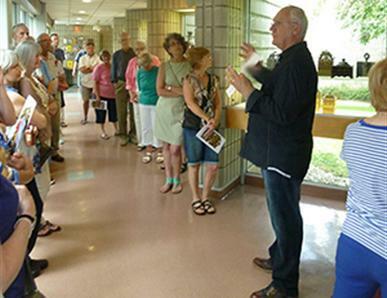 Donn presenting a walking tour of an Exhibition of his work over the past 40 years at the Burlington Arts Centre. 21 pieces from this collection has been included in the Centre's Permanent Collection in 2013. 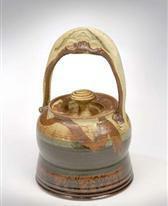 In 2013 Donn donated 21 pieces of work spanning his life as a Potter to the Burlington Arts Centre Permanent Collection. The National Museum of Civilization in Ottawa. 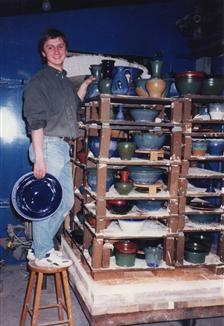 Donn Throwing Pottery as a student at Central High School in Hamilton. Photo taken in l966. 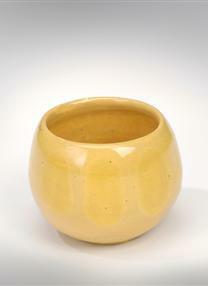 First Bowl made in 1966. 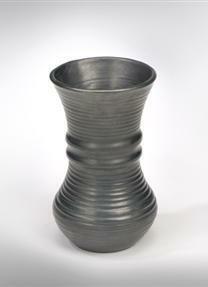 Vase Form (carved) in 1966. 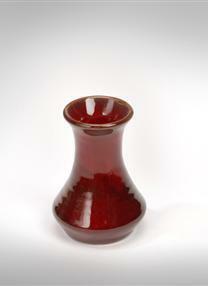 Vase Form made in 1966. 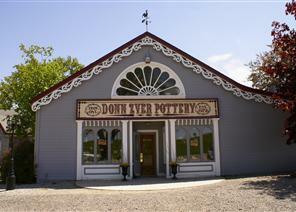 Donn's high school art teacher told him to give up any ideas about making a living at Pottery. She also cut the ribbon when he opened his studio and still visits Donn all these 45 years later. 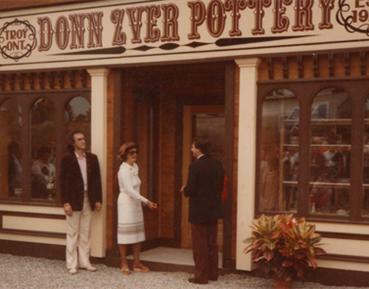 June Hetherington - Pinkney cuts the ribbon to Donn's Pottery Studio in 1983. To her left is Donn and to her right is the Mayor of Flamborough Chris Ward. 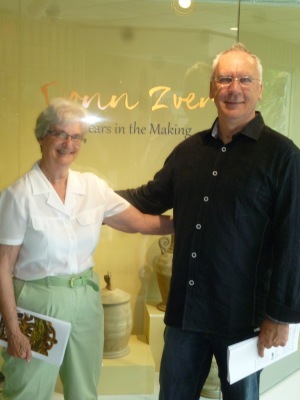 June Hetherington - Pinkney uncovers the name to the Donn Zver Pottery 1983. 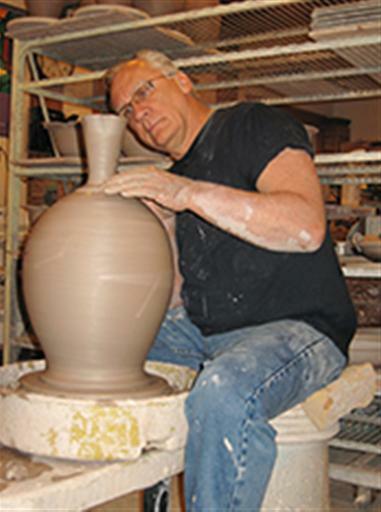 Donn has become one of this area's best known artists and his mugs, dinnerware, vases and casserole dishes are used in many homes in Ontario and far beyond. 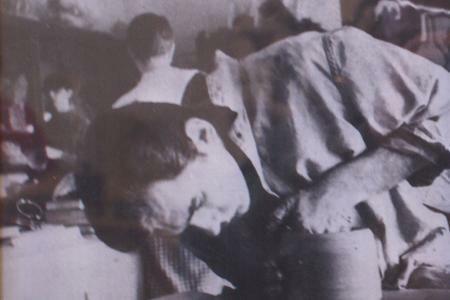 This year he will celebrate 44 years as a potter. His studio has become a destination in itself. Donn and his staff make about 10,000 pieces a year. Visitors can step into Donn's studio and watch him work on the wheel. 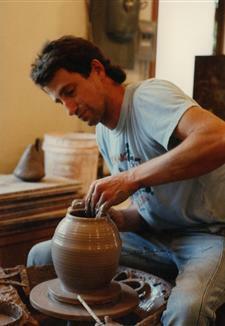 Donn knew from his first experience with clay that it was what he wanted to do. "I love the tactile quality of clay"
" The greatest enjoyment comes when I realize that someone else enjoys my work enough to include it in their lives and homes"
He skipped classes at the former Hamilton Collegiate in Hamilton to work on his wheel and was not deterred by anyone who said potters were starving artist. Sheridan College School of Design. He pulled off the Queen Elizabeth Way and became a student. through out his studies there. Donn loading the Salt Firing Kiln at Sheridan in 1967. Donn loading the updraft Kiln at Sheridan in 1967. 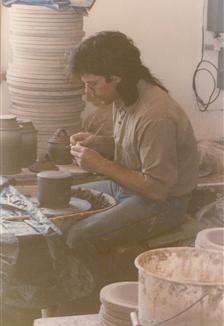 Donn was the Pottery Technician at Sheridan for 3 years. His time there was spent sharpening his skills. 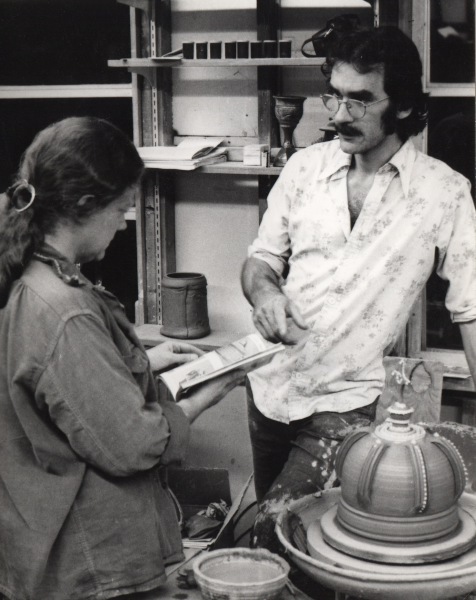 Over the years Donn has continued his relationship with Penland visiting his Mentor Cynthia Bringle. 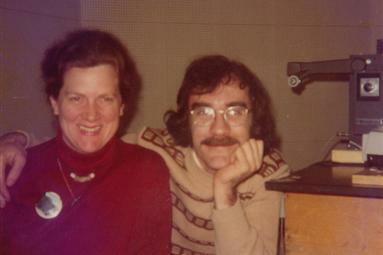 Donn with Cynthia Bringle at Penland School in the early 1970's. the course had 152 students. With Donn's senior students, they built the first Gas Fired Kiln in Hamilton. 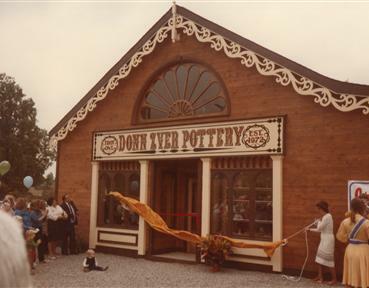 In the next year, 1972 Donn operated a co-op studio outside of Dundas Ontario with potter Bodil Person and weaver Fran Wong. 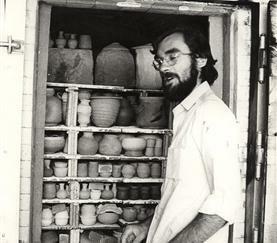 Here he also taught at the Valley School of Art and built their first Gas Kiln in 1972. 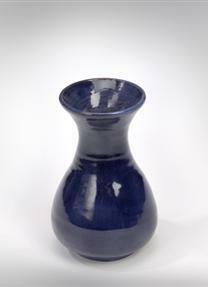 During his time in Dundas Donn had his first Solo Exhibition of his work at the Canadian Guild of Potters Gallery in Toronto. Two pieces included in Donn's Exhibition at the Canadian Guild of Potters. 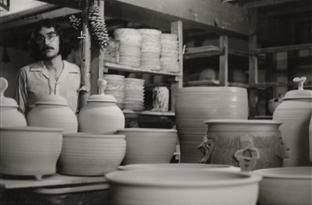 Donn in his studio in Dundas Ontario 1972. 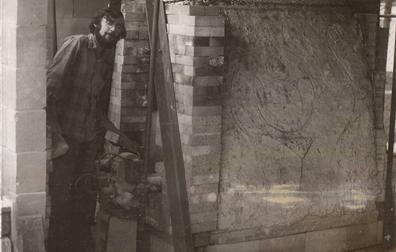 Donn working on Slab Boxes at his studio on the family farm. Donn's first Apprentices, Elaine and Kim. 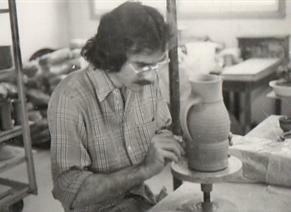 Donn finishing the handle on a Jug. It was not until he bought property in 1980 on highway 5 in the village of Troy the Donn truly left his art teacher's warning behind. Now Donn greets more then 25,000 people a year at his studio. 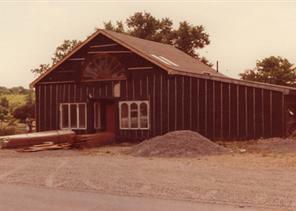 He restored the 1935 garage on the property and opened his studio and gallery in 1982. He also restored a home on the property built in 1861. 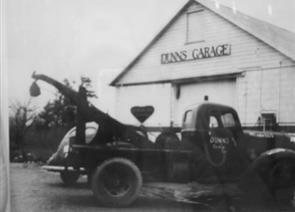 Dunn's Garage pictured in 1935 was bought by Donn in 1980. Over the next two years Donn restored the building for his new Studio. Restoration of the building took 2 years. The studio as it appears today 2016. The studio continued to grow and develop, but for Donn this was not enough, he still believed that his business skills could be challenged. So in 1996 he built Cafe Troy. The Cafe and Pottery went hand in hand as Donn used his pottery in the Cafe which was a great benefit to the businesses. The Cafe helped to drive the Pottery Business. The Restaurant developed a reputation of quality local Food, including winning Restaurant of the Year for the city of Hamilton. In the time honoured traditions of the Artisan, Donn is committed to nurturing apprentices. They stay with him for three to six years before spreading their wings. "It's more important now that Colleges are cutting back on the Arts in favour of technology." 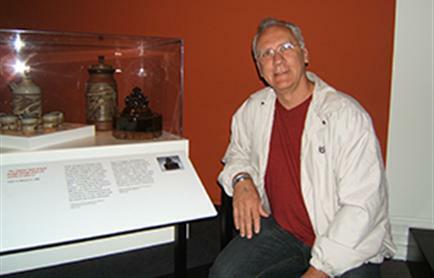 Glenn Gagnier worked with Donn in the mid 1980's. Victor Duffues worded with Donn in the early 1990's. 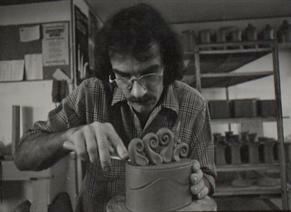 With his wife Jose he operates a Pottery on Vancouver Island. Here is Pavlo opening his first firing at Donn's Studio. 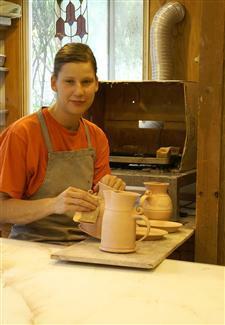 He now runs a successful Pottery in Rockton, Ontario. Donn's studio assistant, Tamera, she has worked with Donn for 17 years. Donn calls his pottery evolutionary. He has always favoured rich, earthy tones even during the pastel craze of the 70's. "The business end of the things comes naturally if you are in touch with the customers." says Donn, who greets longtime customers with a hug. From 9:30 am until 5:00 pm.